Two different eras, two different systems, two different objectives. For those born after 1960 it is hard to picture a city like Johannesburg (today so dominated by motor vehicles) as ever having an extensive and fully fledged tram system. The Johannesburg Tramway Network operated between 1891 (initially horse-drawn) and 1961 where, after having been gradually replaced by the trolleybus system from 1936, it was eventually phased out. The blog Johannesburg 1912 provides a well researched and interesting short history of the Joburg tramways which we highly recommend for anyone interested in the tram topic in particular and Johannesburg history in general. Some great photographs and reflections can also be found in the excerpts of a 1961 ‘farewell to the tramcars’ article featured on the Heritage Portal. While running through some of the old photos in the post, we took a moment to reflect on the jestful quip; “we were so futuristic in the past, weren’t we!” The two-toned double-decker tram cars, with their overhead electric lines, ornate poles and dedicated lanes, juxtapose the sepia-toned scenes of old Johannesburg as transport time travelers; vehicles of a future world outlived in the past. Flash forward to today, the emphasis of citywide public transport planning in Johannesburg in recent years gave us cause to compare the old tramway network against its closest contemporary ‘equivalent’, the Bus Rapid Transport (BRT) system. Finding an accurate map of the old Tramway Network was a little tricky, but we settled on a beautifully drafted Tourist Map of Johannesburg, sourced from the David Rumsey online historical map archive, which provided a good depiction of the network circa 1951. 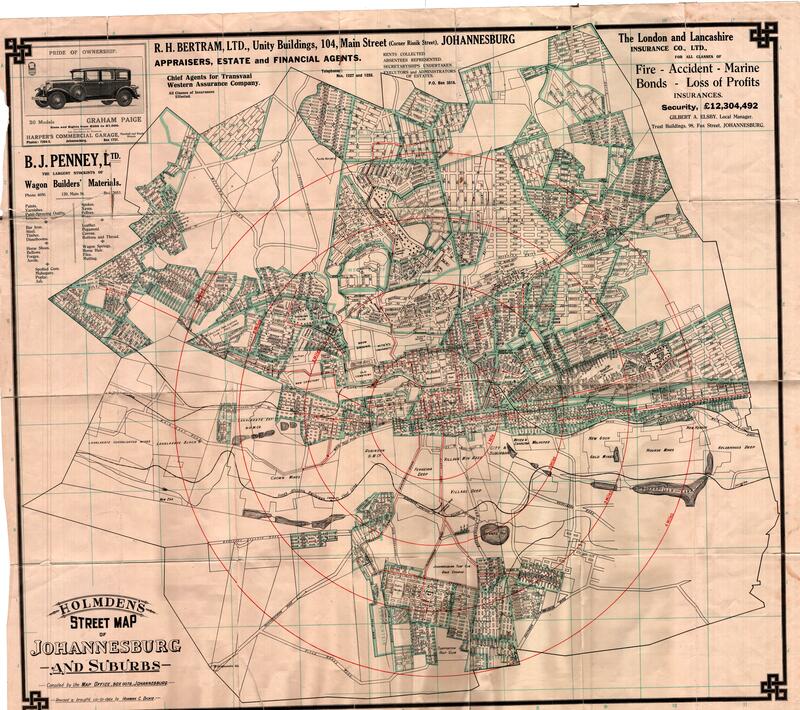 A 1929 Holmden Street map with the tramways physically drawn thereon was used as a cross-check in areas where it offered more detail than the Tourist Map. A base map was built using Mapbox with the data served and visualised through an interactive Carto map [see Map Inset]. Here you can pan and zoom to your own areas of interest, and display the various layers in combination using the legend. The resulting data shows some interesting contrasts between the two networks! One can see that the Tramway and BRT networks largely differ in terms of their orientation, coverage and service areas. The Tramway Network had a radial pattern that was centred on the CBD. Tramcars dominated the east-west routes through the (historically white) ‘downtown’, whereas Trolleybuses were more prevalent among the north-south routes linking into surrounding (historically white) suburbs. The tramway system was clearly designed for the public transport of middle-class citizens, offering little to no coverage in non-white areas. The BRT on the other hand extends as a limb stretching out towards the south-west. The trunk route is anchored on either end by the CBD in the east, and greater Soweto in the south-west. Feeder routes to the trunk are more prevalent in the west and south western regions. For the most part, the BRT was designed for the public transport of lower income citizens which, given Johannesburg’s apartheid spatial legacies, are predominantly non-white and located around the western/south western periphery of the city. Two different eras, two different systems, two different objectives, two different beneficiary groups…50 years apart – and yet essentially the same thing: dedicated-lane vehicles carrying people from one opportunity area to another. The differences between the Tramway and BRT systems are indicative of the planning shift in post-apartheid South Africa towards uplifting historically (and spatially) disadvantaged citizens.